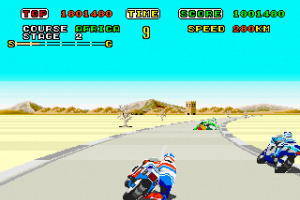 In this game you race a motorcycle around the world, completing each section of track within a time limit. 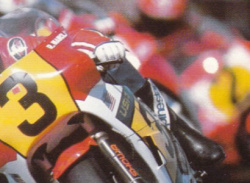 There are other bikes on the road, but beating them is not important, so they can be thought of as moving obstacles. Each continent has a different difficulty level: Africa is beginner, Asia is junior, the Americas are senior, and Europe is expert. 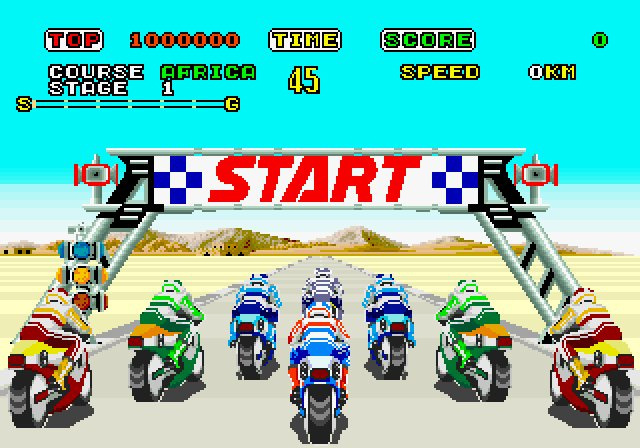 This is a very simple and straightforward game, viewed from behind the bike in 2D (so the screen does not tilt with the bike). The right/left controls are steering, and up/down are gear changes. Your cycle is always moving, and your speed strictly depends on the gear you are in, although contact or running off the road slows the bike down. Yay, So Sega hasn't abandonded VCA! 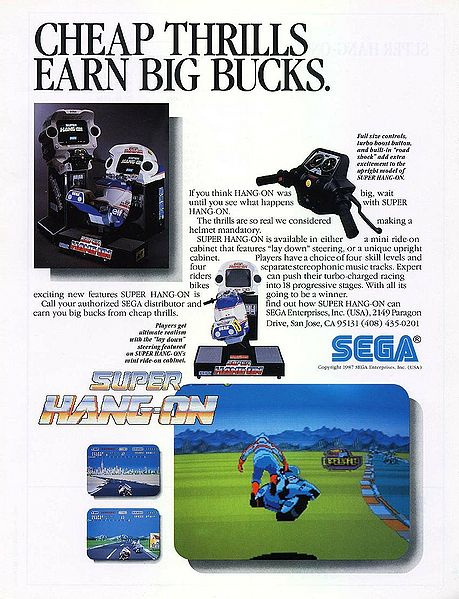 It's always good to have more pseudo 3D Sega arcade games. 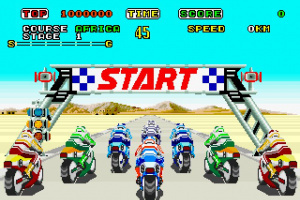 I used to play this a lot on my friend's Genesis, Great game. My current most wanted download Dont hold out too much hope for OutRun though, without a Ferrari license you'll get that weird generic car from the Shenmue 2 version. I have the Saturn version of OutRun, which is still the best after all these years! Finally, a game that sounds like an Arcade game and not feel like a NES/ported Genesis game. I should consider picking this one up. wil this game run at 60hz and be full screen? 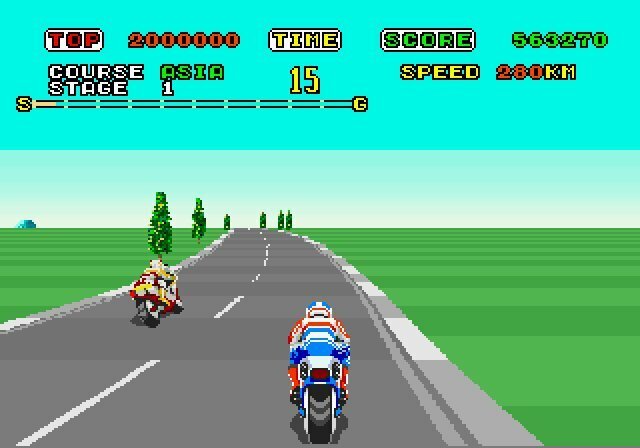 I believe all arcade games run at 60hz and at at full screen. I have the genesis cart still. This is one of my favorites and I personally think it is better than Outrun (at least on the genesis). Too bad NA will probably never get it. It took 2 years for the UK to get it and the Wii doesn't have another 2 years left for the US to catch up. Virtual Console could have been so much better, but botched up releases like this is what ultimately killed the service. Oh well, same old tired song that I don't want to hear anymore. Enjoy this fine release UK gamers. any opinion's on this game? It look's interesting but Im on the fence about getting it. Just downloaded it! Pretty awesome. 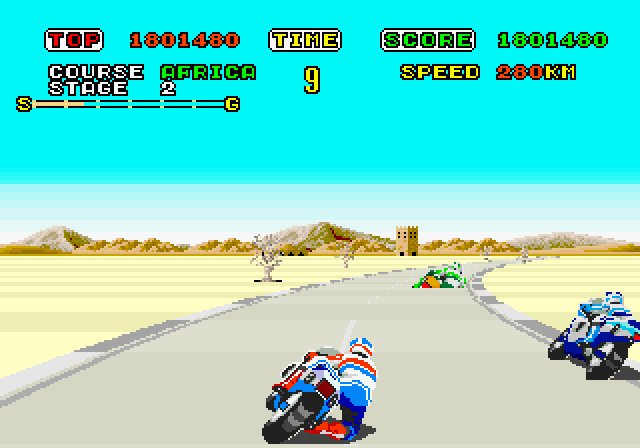 It has Wii Wheel/Accelerometer support to recreate the arcade handlebars, but you can play it with GCN, classic controller, or just the Wii Remote's cross pad. Get it if you love Sega arcade racers, or arcade racers in general.